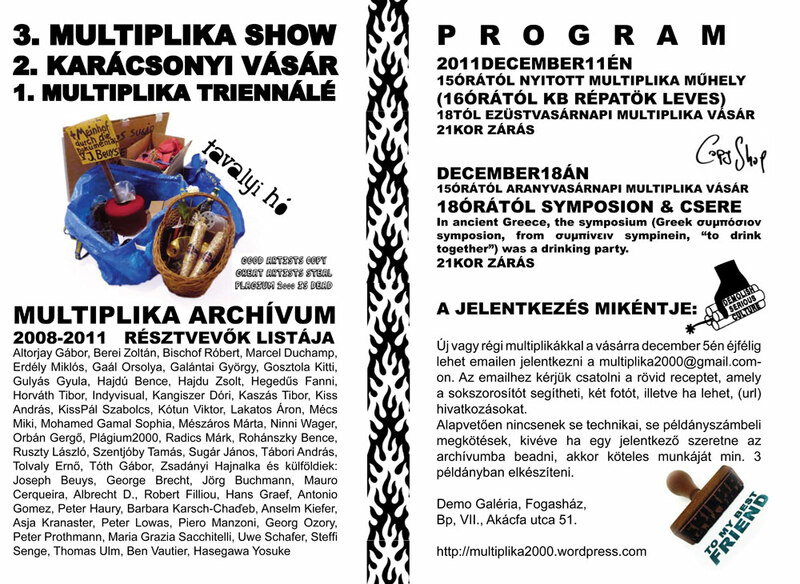 Now we are organizing the 3rd Multiple Show (the first Multiple Triennale) in Budapest in the Demo Galéria run by our friends from Akademie die Bildenden Kunsten. From 11th of december till the 18th of december – including two sundays as part of the christian-consumerist christmas shopping phenomena – we install the Multiple Archive, with the objects and with a photo-love-story printed on the wall about the 1st Multiple Show in Budapest, the Picnic in Bp, the CopyShop in Stuttgart, and the Archive in Budapest + additional episods and documents of the 3year long process 2008-2011. As for the Multiple Sales we accept new multiples – with less rules this time. Which means one can participate even with one or two copy unless she wants to give a copy to the Multiple Archive. We wont express any central directive for the prises neither.